Democrat Bill de Blasio Elected Mayor, Says NYC Has Chosen "Progressive Path"
Bill de Blasio: NYC Has Chosen "Progressive Path"
Bill de Blasio, an unabashedly liberal Brooklynite who tapped frustrations over the city’s yawning income gap and aggressive police tactics, defeated Republican Joseph Lhota to become New York’s first Democratic mayor in two decades and the face of the city as it moves past the 12-year reign of Michael Bloomberg. "The people of this city have chosen a progressive path," he told cheering supporters Tuesday night at the Park Slope Armory YMCA. With 99 percent of precincts reporting, de Blasio had 73 percent and Lhota had 24 percent, according to unofficial returns. When results are certified, de Blasio is poised to break a margin-of-victory record for a non-incumbent set 40 years ago in 1973, when Democrat Abe Beame beat Republican John Marchi by 40.25 percentage points, and appears likely to have achieved the third-largest winning margin ever for a New York City mayor. De Blasio, who just a few months ago was running fourth in the Democratic primary, capped an extraordinary run in which he consistently pushed all the right political buttons, soundly beating many of the city’s most seasoned politicians. He exploited the unease of New Yorkers who felt left out of the city’s financial wealth, and its booming real estate market. He promised to curtail police stop-and-frisks just as a backlash against the tactic was flourishing. And he deftly played upon New Yorkers’ fatigue with Bloomberg without alienating those who approved of his performance. He did all of this while appearing like a nice, regular guy, an image enhanced by his photogenic mixed-race family, whom he featured in television ads and brought out on the campaign trail. De Blasio’s campaign was so effective that in the final weeks of the race, the question was not whether he would beat Lhota, but by how much. While de Blasio ran a nearly perfect campaign, Lhota could not seem to do anything right. A battle-tested municipal manager, Lhota struggled to convince New Yorkers that his experience as a former deputy mayor under Rudy Giuliani, when he helped guide the city’s response to the 9/11 terror attacks, and his widely praised leadership of the MTA during Hurricane Sandy, made him the most qualified candidate. When that argument failed to catch on, Lhota went negative, warning that crime would rise to 1980s levels if de Blasio became mayor. That didn’t work, either. 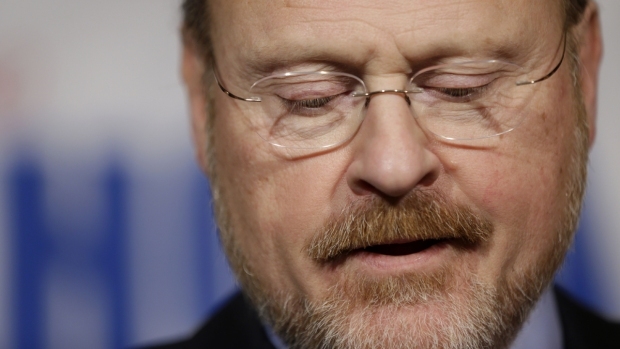 Lhota also struggled against the odds in a city where Republicans are outnumbered by Democrats 6-to-1. A majority of voters said Tuesday that they’d made up their minds in September or earlier, according to an Edison Research/Marist exit poll. De Blasio drubbed Lhota in virtually every voting bloc: women and men; blacks, whites and Latinos; the well-off and the poor, the exit poll shows. Lhota’s small victories came among the segments of the electorate who described themselves as white Catholics and who said they were concerned most about crime. Lhota conceded defeat in a speech just before 10 p.m. at the Gansevoort Hotel in Manhattan, acknowledging that the race had been uphill from the beginning. Lhota Concedes: "Let's Move Forward"
Republican Joe Lhota concedes the mayoral race to Democrat Bill de Blasio, declaring "we are one city" and telling supporters, "Let's move forward." De Blasio’s victory signaled that New Yorkers were anxious to say goodbye to Bloomberg, a billionaire technocrat whose wealth inoculated him from partisan influences but exercised an imperious streak that often made him seem insensitive to the plight of those struggling to make it. He entered office just after the 9/11 terror attacks, helped steer the city through an economic downturn, and presided over historically low crime rates. But his popularity began to wane after he pushed through a law that allowed him to skirt term limits. Tuesday’s results reflected New Yorkers’ ambivalent relationship with their outgoing mayor: they like him, but want him to go. Half of the New Yorkers who voted Tuesday said they approved of Bloomberg's performance, according to the Edison Research/Marist exit poll. But a vast majority of voters also said they wanted the city to move in a different direction. A large reason, apparently, is voters’ unease over the economy. Asked to name the issue that drove their decision, more than a third cited jobs and unemployment -- significantly more than any other issue. A majority of voters said they believed the economy was not good or poor. Three-quarters said their family's financial situation was no better than it was four years ago. That sentiment clearly favored de Blasio, who made income inequality and the fact that 45 percent of New Yorkers live at or near poverty, a centerpiece of his campaign. His signature promise was to raise income taxes on New Yorkers who earn more than $500,000 to fund universal pre-kindergarten. Lhota, and many political strategists, said the pre-K plan was unfeasible because it requires approval from state lawmakers and Gov. Andrew Cuomo, who are up for re-election next year. But de Blasio has vowed to wield his margin of victory as a mandate that he will use to persuade Albany to back his plan. Born in Brooklyn and raised in Massachusetts (he remains a fan of the Boston Red Sox and the New England Patriots), de Blasio is a career political operative who worked as a union organizer and advocated on behalf of Nicaragua’s Sandinista government in the 1980s before joining David Dinkins’ 1989 mayoral campaign. In 1997, he became an aide in the U.S. Department of Housing and Urban Development under Cuomo, then the agency's secretary. De Blasio managed Hillary Clinton’s successful 2000 campaign for U.S. Senate, then won a seat on the city council, representing a swath of brownstone Brooklyn. In 2009, he was elected as the city’s public advocate, a position he will hold for a few more weeks. He announced his campaign for mayor in January, and went on to beat a crowded Democratic primary field with enough votes to avoid a runoff. De Blasio has said that his three top priorities upon taking office would be to start lobbying Albany for his tax plan, develop a more aggressive version of the paid sick leave bill that passed the council earlier this year and select a police commissioner who will begin implementing reforms to policies that guide officers’ approach to stop-and-frisk. He has also said that he would drop the city’s appeal of a federal judge’s ruling that stop-and-frisk was unconstitutional. One of the biggest looming challenges is finding a way to pay unionized city workers who have been working without new contracts for years. The tab for retroactive raises could hit $7 billion. "The road ahead will be difficult but it will be traveled," de Blasio said in his victory speech. "These changes won’t happen overnight. But they will happen. There will be many obstacles that stand in our way, but we will overcome them."